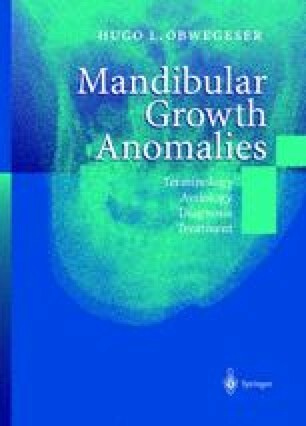 Does our present-day knowledge concerning growth and development of the mandible permit us to explain easily how these asymmetrical anomalies of the mandible develop? It is not intended to repeat and discuss here the complex subject of the growth of the various bones of the complete facial skeleton. For that we may use the various well known publications on the subject of facial growth (D.H. Enlow 1982, 1990; A. Björk 1955; A. Björk and V. Skieller 1977; Björk and Skieller 1983; A. Brodie 1941; M.L. Moss 1962, 1968; M.L. Moss and P. Salentijn 1969; D. Precious and J. Delaire 1987; P. Stöckli 1994). On the other hand, extensive clinical experience with patients relating to the growth of the mandible may bring additional knowledge to the complex problem of mandibular growth and in particular the role of the condyle. Of course, the mandible cannot be viewed, from the growth physiology point of view, as an isolated piece of bone independent of its surroundings and their influence, although one might often form the impression that this is so.